"What is your name?" he asked me. He asked me what my name was. "How old is your mother? ", he asked. He asked how old her mother was. The policman said to the boy, "Where do you live?" The policeman asked the boy where he lived. "What time does the train arrive?" she asked. She asked what time the train arrived. "When can we have dinner?" she asked. She asked when they could have dinner. Peter said to John, "Why are you so late?" Peter asked the John why he was so late. She walks home from school. The children are sitting in the garden. They go to work by bus. Jenny isn't sleeping late today. 1. Who wrote the book "Of Mice and Men"? Answer Correct: Who wrote the book "Of Mice and Men"? 2. When they get married? Answer Incorrect Correct question: When did they get married? Correct question: When will they get married? 3. How much it costs? Answer Incorrect Correct question: How much does it cost? Correct question: How much did it cost? Correct question: How much will it cost? Answer Correct: What size do you wear? 5. Who he sent a card to? Answer Incorrect Correct question: Who did he send a card to? 6. How long will it take you to get there? Answer Correct: How long will it take you to get there? Answer Correct question: Where was he born? 8. Whose painting the art critic talking about? Answer Incorrect Correct question: Whose painting is the art critic talking about? Correct question: Whose painting was the art critic talking about? Correct question: Whose painting will the art critic be talking about? 10. Who are offering us help? Answer Incorrect Correct question: Who is offering us help? 11. What caused the boy's death? Answer Correct: What caused the boy's death? It takes me half an hour if the traffic isn't too bad. At that strange animal over there. Write short questions ending in a preposition in response to these statements. 14. I'm writing a book ___________________________? 15. I want to speak to you ___________________________? 16. I need some money as soon as possible ___________________________? 17. I'm going away next week. ___________________________? 18. I've just received a letter ___________________________? 19. She's getting married next week ___________________________? 20. Could you wipe up the coffee that you've spilt on the floor? ___________________________? John loves Susan, but Susan doesn't love John. She loves Frank. Frank loves Jane and Jane loves John. Write the questions for these answers based on the information above. Write questions for these answers using 'like' as a verb or preposition. 25. ___________________________________? Lets go to the cinema. 26. ___________________________________? It was very hot and humid? 27. ___________________________________? She's got blond hair and she's very nice. 28. ___________________________________? Sailing, surfing and doing Jui-Jitsu. 29. ___________________________________? A bit like you, actually. Same height and build. 30. ___________________________________? They say she'll be in hospital for another week. Write reply questions for these in response to these statements. 31. He's come from New York. ___________________________________? 32. She's the new manager. ___________________________________? 33. They work very well. ___________________________________? 34. It's working very well. ___________________________________? 35. He has a Mercedes. ___________________________________? Write 'R' if you think the question tag rises, and 'F' if you think it falls. With the dawn of the Internet, the birth of Internet slang, and the growing use of SMS, many of us are starting to forget the fundamental aspects of English punctuation. Would you like to write a great paper for one of your classes or submit a polished, impeccably written proposal to your boss? If so, proper punctuation is a must. Consider this article a crash course in English punctuation, and see Step 1 below to get started. Always start a sentence with a capital letter. Unless you're an avant-garde poet or you're starting a sentence with a brand name like "wikiHow" or "iPod," you will need to capitalize the first letter of every sentence. Use capital letters to start proper nouns and titles. In addition to starting sentences, capital letters should also occur at the start of proper nouns and titles. Proper nouns are the names of specific people, places, and things. Titles, which are a type of proper noun, are the names of works of art (books, movies, plays, etc. ), institutions, geographical areas, and much more. Titles can also be honorifics (Her Majesty, Mr. President, etc.). · Titles and proper nouns consisting of more than one word should have every word capitalized, except for small words and articles like "the," "an," "and," etc. The first word of a title should always be capitalized (with the above "brand name" exception). In her opinion, Queen Roberta's favorite museum in the world is theSmithsonian, which she visited during her trip to Washington, D.C., last year. Use capital letters for acronyms. An acronym is a word (or a "coined" word) formed from the first letter of every word in a long proper noun or title. Acronyms are frequently used to shorten long proper nouns that would be awkward to reprint in their entirety every time they are mentioned. Sometimes the letters of an acronym are separated by periods. The CIA and the NSA are just two of the USA's many intelligence agencies. Use a period (full stop) to end declarative sentences and statements. Every sentence contains at least one punctuation mark -- the one at its end. The most common of these sentence-ending punctuation marks is the period (". ", also called a "full stop"). 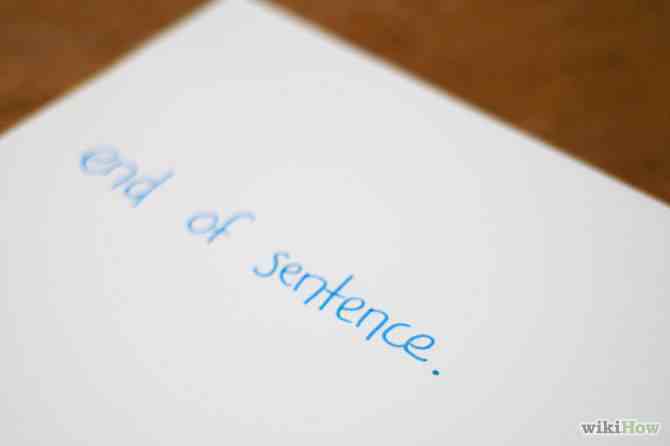 This simple dot is used to mark the end of a sentence that is declarative. Most sentences are declarative. Any sentence that states a fact or describes or explains an idea is declarative. Use a question mark to end questions. The question mark ( "?" ) used at the end of a sentence denotes an interrogative sentence -- basically, a question. Use this punctuation mark at the end of any question, query, or inquiry. Use an exclamation point to end exclamatory sentences. The exclamation point ("! ", also called an "exclamation mark" or "shout mark") suggests excitement or strong emphasis. The exclamation point is used to end exclamations -- short expressions of intense emotion that are often only one word long. I can't believe how difficult the exam was! Use a comma to indicate a break or pause within a sentence. The comma (",") is a very versatile punctuation mark. There are dozens of situations that might require the use of a comma. 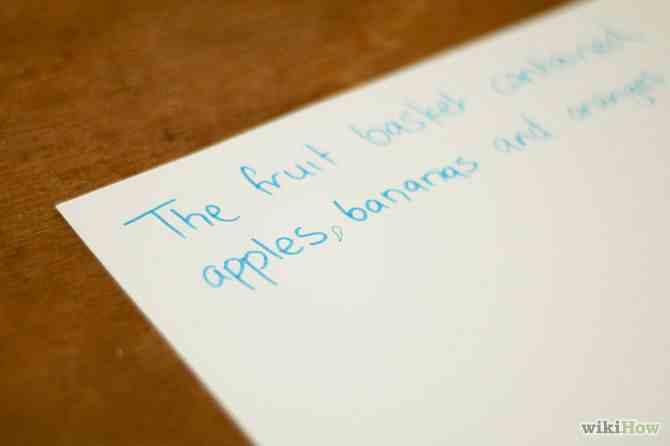 One frequent case is the appositive -- a break within a sentence that supplements and adds information to the subject. Use a comma when listing three or more items in a series. A common use of commas is to separate items that are being listed in a sequence. Usually commas are written between each of the items and between the second-to-last item and a subsequent conjunction. · However, many writers omit the comma before the conjunction (called a serial comma or "Oxford comma"), as conjunctions like "and" will signal the end of the list even without the final comma. · Here are two examples of commas used in listed series -- one with an Oxford Comma and one without. Use a comma to separate two or more adjectives describing a noun.Sometimes consecutive adjectives are used to describe a single subject with multiple qualities. This use of commas is similar to using them to separate items in a series, with one exception: it is incorrect to place a comma after the final adjective. Use a comma to separate a larger geographical area from a smaller one located within it. Specific geographical places or areas are usually named by starting with the smallest location's name and then proceeding to the larger area. For instance, you might refer to a specific city by naming the city itself, followed by the state or province it is in, followed by the surrounding country. Each geographic name (except the last) is followed by a comma. Note that a comma is used after the last (largest) geographical area if the sentence continues. Use a comma to separate an introductory phrase from the rest of the sentence. An introductory phrase (which is usually one or more prepositional phrases) briefly introduces the sentence and provides context but is not part of the sentence's subject or predicate. Therefore, it should be separated from the main clause by a comma. On the back of my couch, my cat's claws have slowly been carving a large hole. Use a comma to separate two independent clauses. Having two independent clauses in a sentence simply means that you could split the sentence into two shorter sentences while preserving the original meaning. If your sentence contains two independent clauses that are separated by a conjunction (such as and, as, but, for, nor,so, or yet), place a comma before the conjunction. Use a comma when making a direct address. When calling one's attention by saying his/her name at the start of a sentence, separate the person's name from the rest of the sentence with a comma. Note that this comma is somewhat rare in writing, because this is something normally done while speaking. It's more common for a writer to employ other methods to indicate who is speaking to whom. Use a comma to separate a direct quotation from the sentence introducing it.A comma should occur after the word immediately preceding a quotation that is being introduced with context or a description. On the other hand, it is not necessary to use a comma before an indirect quote (where you are paraphrasing someone's words without quoting them exactly). Additionally, a comma is usually not necessary if you are not quoting an entire statement, but only a few words from it. While I was at his house, John asked, "Do you want anything to eat?" According to the client, the lawyer was "lazy and incompetent." Use a semicolon to separate two related but independent clauses. The proper use of a semicolon is similar, but not identical, to that of a comma. The semicolon marks the end of one independent clause and the start of another within a single sentence. Note that, if the two clauses are very wordy or complex, it is better to use aperiod (full stop) and form two sentences instead. 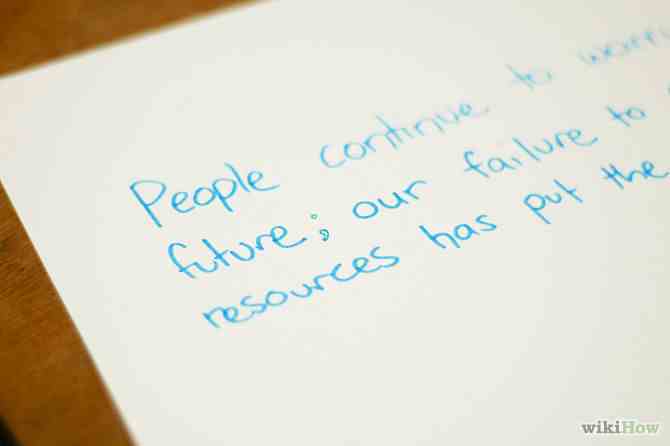 People continue to worry about the future; our failure to conserve resources has put the world at risk. Use a semicolon to separate a complex series of items. Usually, the items in a series are separated by commas, but for cases in which one or more items require comment or explanation, semicolons can be used in conjunction with commas to keep the reader from becoming confused. Use semicolons to separate items and their explanations from one another. To separate an item from its own explanation, use a comma. I went to the show with Jake, my close friend; his friend, Jane; and her best friend, Jenna. Use a colon to introduce a list. Be careful, however, not to use a colon when stating an idea that requires naming a series of items. The two are similar, but distinct. Often the sentence-ending words "the following" or "as follows" will call for the use of a colon when they are followed by new, explanatory information. The professor has given me three options: to retake the exam, to accept the extra credit assignment, or to fail the class. The Easter basket contained: Easter eggs, chocolate rabbits, and other candy. In this case you would simply omit the colon. Use a colon to introduce a new concept or example. Colons can also be used after a descriptive phrase or explanation to imply that the next piece of information will be the thing being described or explained. It can help to think of this as introducing a list containing only one item. There's only one person old enough to remember that wedding: grandma. Use a colon to separate parts of a title. Some works of art, particularly books and movies, can have long, subdivided titles. In these cases, what follows the main title is called a subtitle. Use colons to separate them. Fred's favorite movie was The Lord of the Rings: The Fellowship of the Ring, though Stacy preferred its sequel, The Lord of the Rings: The Two Towers. Use a hyphen when adding a prefix to some words. The purpose of this hyphen is to make the word easier to read. For instance, if you were to leave the hyphen out of the word re-examine, it would be reexamine, where the double "e" could be confusing. 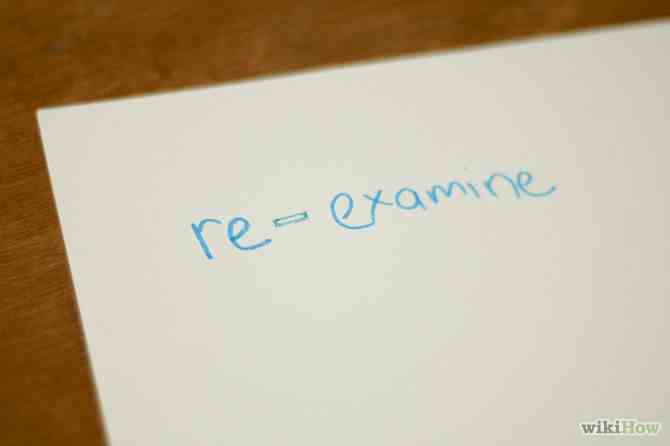 Many words do not require a hyphen to separate the prefix from the word, such as restate, pretest, and undo. Let a dictionary be your guide for when to use the hyphen after a prefix. Use hyphens when creating compound words from several smaller words. If you've ever written about anything that's gold-plated, radar-equipped, or one-size-fits-all, you've used a hyphen in this way. To build a long, descriptive word out of two or more component words, use hyphens to separate the "pieces" from each other. The up-to-date newspaper reporters were quick to jump on the latest scandal. Use a hyphen when writing numbers out as words. Separate the two words of any number under one hundred with a hyphen. Be careful with spelling out numbers above one hundred — if the number is used as an adjective, it is completely hyphenated, since all compound adjectives are hyphenated. (This is the one-hundredth episode). Otherwise, a hyphen should occur only if a number lower than 100 is embedded within a larger number, e.g., He lived to be one hundred twenty-one. · Don't use "and" when writing numbers, as in "The amount is one hundred andeighty." This is a common error in the US and Canada, where the "and" is usually omitted. Elsewhere in the English-speaking world, however, the "and" can be included. There are fifty-two playing cards in a deck. The packaging advertised one thousand two hundred twenty-four firecrackers, but it contained only one thousand. Use a dash when making a brief interruption within a statement. The dash ("--" or "—") is slightly longer than the hyphen and is used to convey a sudden change of thought, an additional comment, or a dramatic qualification within a sentence. It can also be used to add a parenthetical statement for further clarification, but this should still be relevant to the sentence. Otherwise, use parentheses. Keep in mind that the rest of the sentence should still flow naturally as if the dashed material were not there. · To judge whether a dash is appropriate, try to remove the words between the dashes. If the sentence appears disjointed or does not make sense, you may need to revise it instead of using the dashes. · There should be spaces before and after a dash in British English. An introductory clause is a brief phrase that comes — yes, you guessed it — at the beginning of a sentence. This is the end of our sentence — or so we thought. Use a hyphen to split a word between two lines. Though this use is not as common today, the hyphen ("-") was once a common punctuation mark on typewriters, used when a long word had to be split between two lines. This system is still seen in some books, but the justification capacity of computer word processing programs has made this rarer. trifying surprise ending out of his head. Use the apostrophe together with the letter s to indicate possession. The apostrophe (" ' ") has a variety of uses for conveying the concept of possession. Be aware of the difference in using an apostrophe with singular or plural nouns. A singular noun will use the apostrophe before the "s" ('s), whereas the plural version of that noun will use the apostrophe after the "s" (s'). This use comes with several stipulations discussed below. · Be mindful of nouns that are always considered to be plural, such as childrenand people. Here you should use 's even though the nouns are plural. · Also be aware of pronouns that are already possessive and do not require apostrophes, such as hers and its. (It's means it is or it has). Their is possessive without apostrophe or s, except as a predicate adjective, where it becomestheirs. The hamster's water tube needs to be refilled. In the pet store, the hamsters' bedding needed to be changed. These children's test scores are the highest in the nation. Use the apostrophe to combine two words to make a contraction.Contractions are shortened combinations of two words. For example, cannotbecomes can't, "it is" becomes "it's", you are becomes you're, and "they have" becomesthey've. In every contraction, the apostrophe replaces the letters that are omitted from one or both words. · Be sure to use the possessive pronoun your and the contraction you'reappropriately. It is a common mistake to interchange them. Friends of hers explained that it's her idea, not theirs, to refill the hamster's water tube and change its bedding. Use a single quotation mark within a regular quotation to indicate a quotation within a quotation. Single quotation marks, which look almost identical to apostrophes, are used to separate quotations from other quotations which surround them. Use these carefully: always make sure every quotation mark used to start a quote is paired with a corresponding one at the end of the quote. Ali said, "Anna told me, 'I wasn't sure if you wanted to come!'" Don't use an apostrophe with an s to make a singular noun into a plural noun. This is a very common mistake. Remember that apostrophes are not used to show the simple pluralization of a noun.